on a weekly basis, i have conversations with people inquiring about washing their face. "am i doing it right? is my cleanser working the way it's intended?" despite it being a seemingly simple task, there really is an effective, "right" way to cleanse. additionally, we all have those habits which may be quick, but they’re doing more harm than good when it comes to fostering the health of our skin. below i cover some frequently asked questions and also outline the cleansing routine that has completely transformed my skin for the better. Q: it doesn’t seem like my cleanser is removing all of my makeup, how do i fix this? A: i’d recommend never trying to remove a full-face of makeup with your cleanser alone. a good rule of thumb is to first remove your makeup (see routine below) and then cleanse. additionally, double-cleansing can be an effective evening habit. also, be gentle around the eye area: use a cotton pad to dab with a gentle makeup remover or a milky cleanser like our coconut + aloe cleanser. Q: should i wash my face in the shower? A: never. in fact, don’t even tempt yourself-always leave your cleanser at your vanity/sink area. putting your face under the shower water, especially if it’s warm, will dry you out and can cause premature aging. when washing your hair, tip your head back towards the water to avoid excess water and shampoo on your face. Q. which ingredients should i avoid in my cleanser and how do i know which product is best for my skin? A. if your cleanser suds or has any type of “soapy” or "foamy" texture, i beg you to get rid of it. if it contains any ingredients with the word “sulfate” it’s probably bad news. these types of cleansers strip the skin of it’s natural oils which can cause an excess production of oil or cause fine lines. if you have oily skin, avoid straight oil cleansers and look for something with a blend of essential oils, aloe vera, clays, and other natural yet active ingredients that will help balance you out. adding in a mask once or twice a week will also help normalize oil production and prevent breakouts. if you have normal to dry skin, a milky cleanser rich in plant-based ingredients should be a great fit to maintain moisture. Q. how often should i exfoliate? A. my philosophy on exfoliation is a “less-is-more” approach, simply because of how many people are over-exfoliating their skin these days. we’re obsessed with tools like clarisonics and scrubs, but in reality, our skin doesn't need a ton of exfoliation. in fact, it naturally knows how to exfoliate on it’s own, and over-exfoliation can really cause issues and confusion. i’m a bigger fan of masks with powerful ingredients, but if you must exfoliate, stick to once a week-any more and your skin is too vulnerable, too often. see routine below for a simple way to “exfoliate” on a daily basis without being too harsh on your skin. *this is an evening cleansing routine. 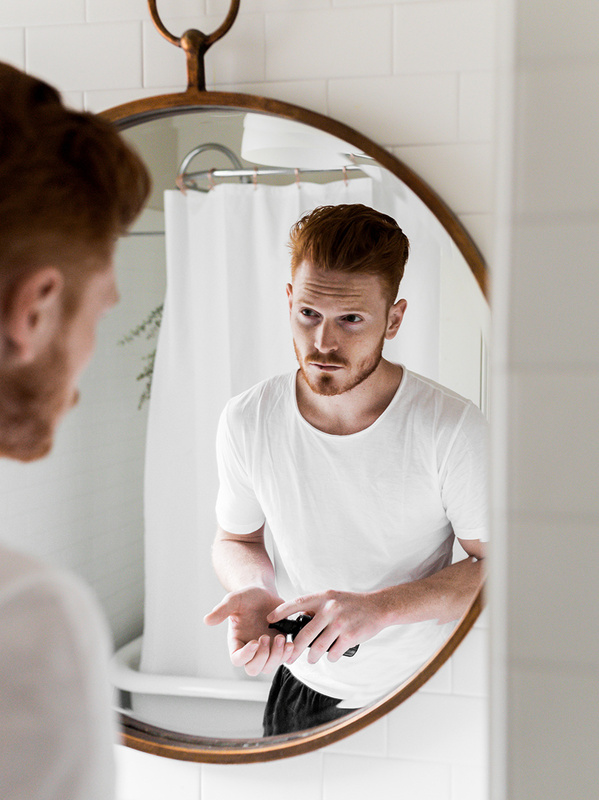 morning cleansing may be necessary for certain skin conditions-but in general, a great serum, moisturizer and SPF may be all that you need for the morning. step 1. take a damp, warm washcloth and place on top of face, gently removing makeup. the towel will gently exfoliate and the warmth will open your pores for deeper product penetration. step 2. in an upward motion, gently massage a generous amount of your cleanser into your entire face, specifically targeting stressed areas like the temples and forehead. if you’re using a milky or oil cleanser, adding a little water halfway through and continuing to work it in will help the texture go a long way. Step 3. remove the cleanser with another warm, damp washcloth. follow with toning and moisture. i realize the washcloth situation is a commitment, but i promise it’s worth it. if the nightly washcloths seem like too much laundry to commit to, at least begin by removing your makeup with something like these towelettes. so how about you? do you have any other tips and tricks for a great cleansing experience? i’d love to hear from you in the comment section below! *the above statements are based purely on opinion and shouldn't be considered medical advice. consult your physician if you feel that you need serious medical attention.